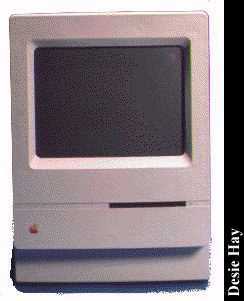 The Apple Macintosh Classic was introduced in October 1990 and was aimed to be a truly low cost computer. I can remember that they eventually sold for around $1000. Mine has been outfitted with 4MB of RAM and a 40MB SCSI hard drive. The manufacture date on the computer is October 1990 so it must be one of the first produced. startup. The ROM contains system 6.0.3 and is what I use for networking the Classic to my Power Mac 7200. XO was the development name for the Macintosh Classic when it was in development. The classic contains 512KB of ROM and nearly 400KB of that is used for the system software. The Macintosh classic doesn't seem to run much faster than the Macintosh Plus which was introduced around 4 years earlier! But the Classic does contain a 1.4MB floppy disk drive. I have even been able to boot this thing using good old system 1! Click here to view all comments for the Apple Macintosh Classic and to leave your own.